Alrighty, time for me to scoot my boot! Ok folks, gotta go. TTYL! Ok folks, I'm off for a fun filled day of coloring. Hope you get a chance to get creative this weekend too. 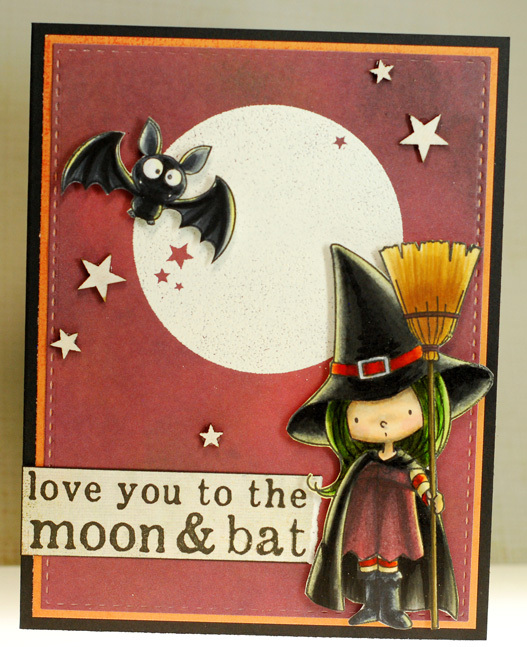 I've got a quick post for a simple card today. This handsome dude is Ian from the Together Anywhere set and I think he looks pretty darn slick. With his turtleneck sweater and long leather jacket I could just picture Ian visiting the country for a weekend and taking in a fall festival while he's there. I can't tell you how much I love these bigger My Guy Ians and Miss Anyas, while I was coloring this one up I couldn't help but hope that we see some new sets added to the TGF family sooner rather than later. Who's with me? Alrighty, I'm totally running behind this morning and there is so much to do. Alrighty, hope your week is off to a fantastic start! 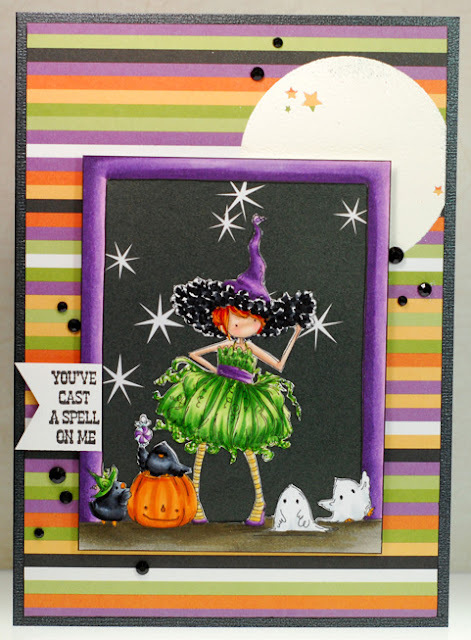 I'm rounding out this week's posts with a final card for the Kraftin Kimmie Koffee Krop challenges. Challenge number #3 is 'monochromatic' and as you can see I got a bit carried away with that, LOL! 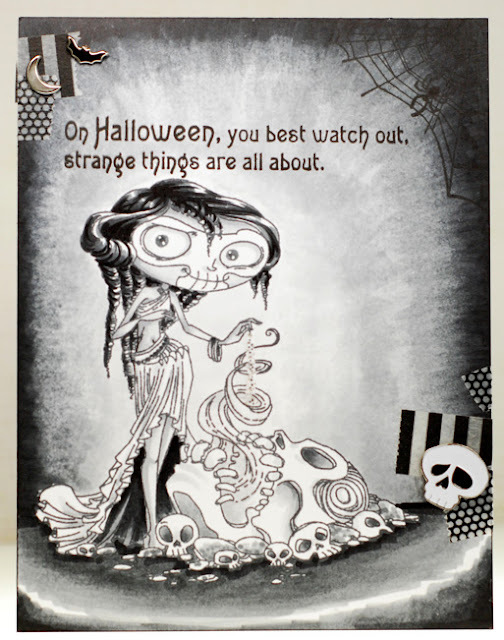 Since I had recently done a sepia toned image I figured this was a great excuse to do some black and white coloring and what better kind of stamp to use with that treatment than a Halloween image? Yep, that's right, mid September and I've officially made my first Halloween card of the year. I was trying to hold out longer but I have so much fun with them that I couldn't help myself. So I inked up Voodoo Lady because she looks muy misterioso, grabbed my whole range of Neutral Grey Copics and just went to town. By the time I was done I realized that I wouldn't need any pattern paper so this is almost another single layer card, go me! 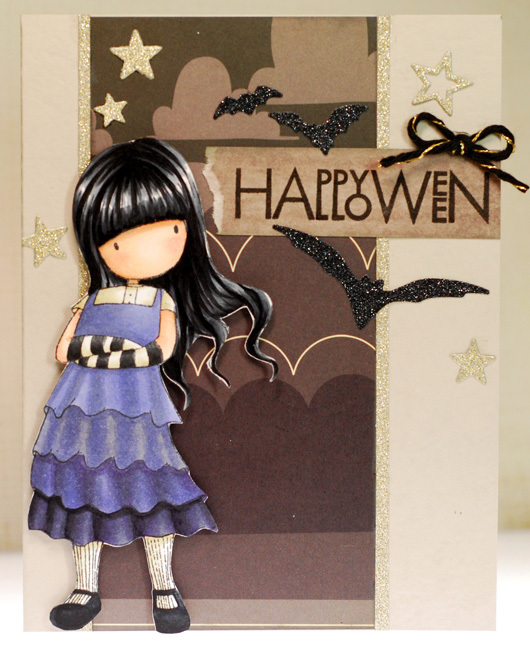 All I added for embellishment was a bit of washi tape and some brads. Oh and the magic dust she is sprinkling along with the spooky mist are actually quite sparkly in person... just couldn't pick it up with the camera. I'm keeping things cozy once again though this time I'm jumping in to play over at Kraftin' Kimmie Stamps. Yesterday I went to check out what their newest Saturday challenge was and instead I found a whole slew of challenges that they have going on this week for their Koffee Krop. So I'm starting with challenge #1 'paper piecing'. 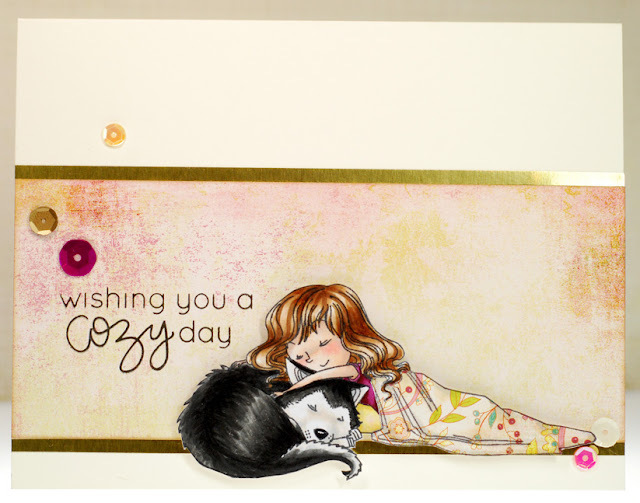 As soon as I saw what the challenge was I knew just the stamp that I wanted to use... this sweet pair of napping buddies from the Feathers and Friends set. 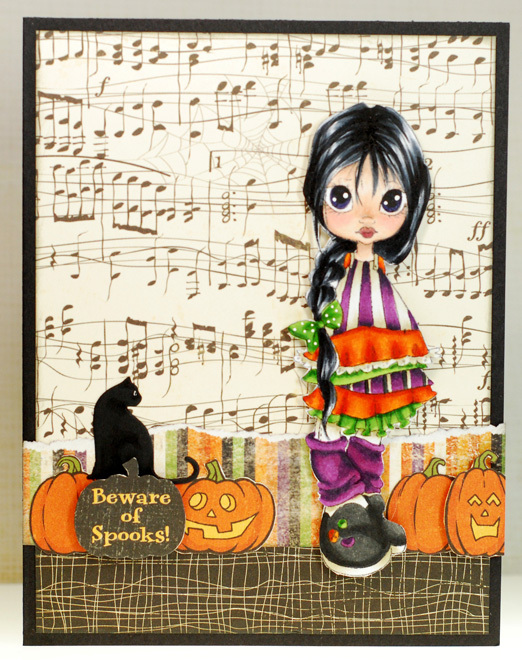 That blanket was just begging to be paper pieced with a pretty print don't you think? I decided to go with a CAS design for the rest of the card and I really like how soft and serene it turned out. 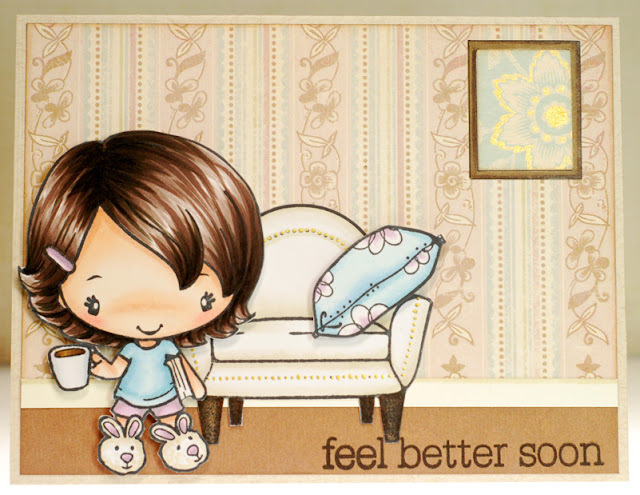 Alrighty friends, have a good one! We are currently experiencing a bit of an early fall heat wave which I'm finding kinda hard to adjust back to. I mean only a couple days ago I was just about to pull out the sweaters and jackets! Oh well, I should enjoy it while it lasts because I really don't want to think about how soon the snow will start falling... eek! Ok gals, I'll talk at'cha later! I'm running behind this morning so I've got to keep this post short and sweet. It's another day, another challenge... and I made today's card for the 'anything goes' challenge over at The Sugar Bowl. 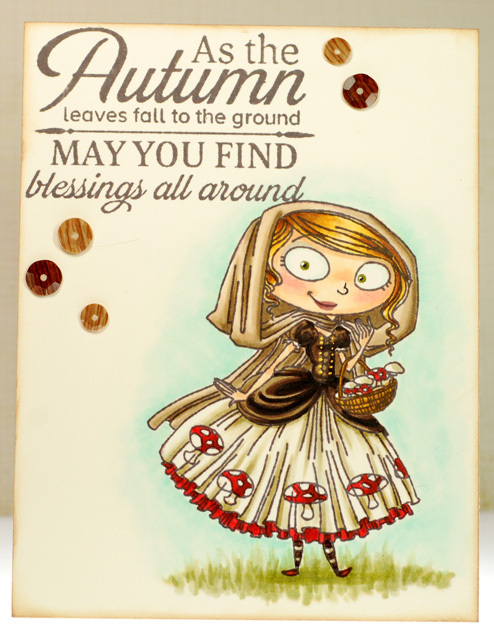 So I grabbed this gorgeous Fairy Glen digi called Dreams & Wishes and again chose a fall color combo that avoided the obvious oranges and reds. This time I mixed gold, green and brown. It's different but still pretty I think. 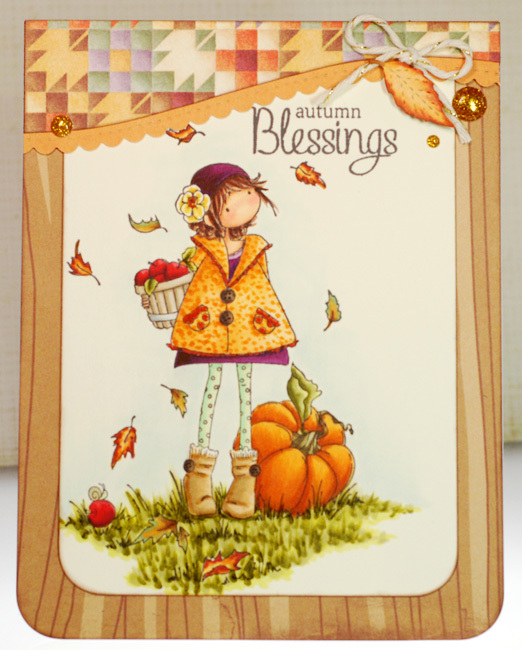 Plus the kraft card base definitely keeps the overall design looking very natural and fall-ish. Guess what I got in the mail Saturday? That's right, new stamps! 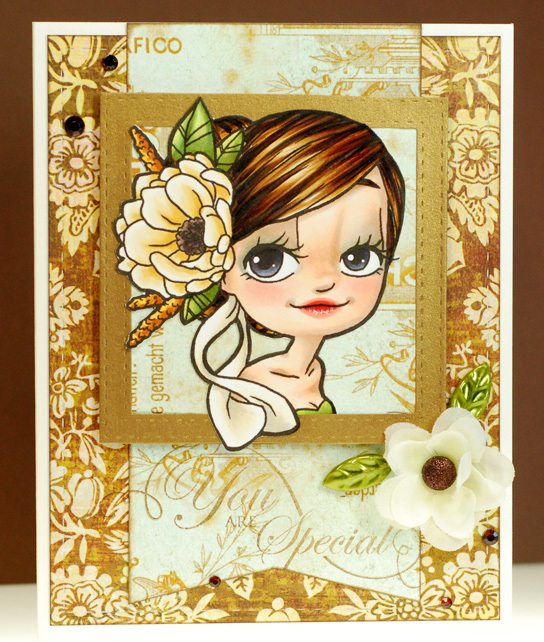 First was the newest Stamp Club stamp from The Greeting Farm and she is an adorable Wild Sprout called Blaire. 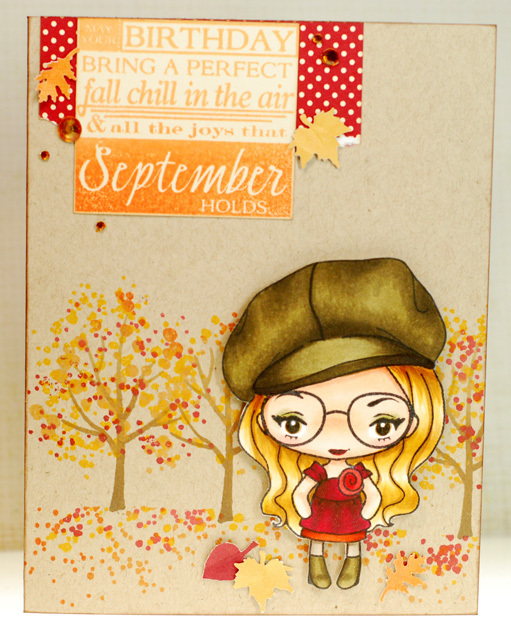 My second little package was from Hero Arts and included the new Color Layering Fall Trees set that I just had to play with right away. 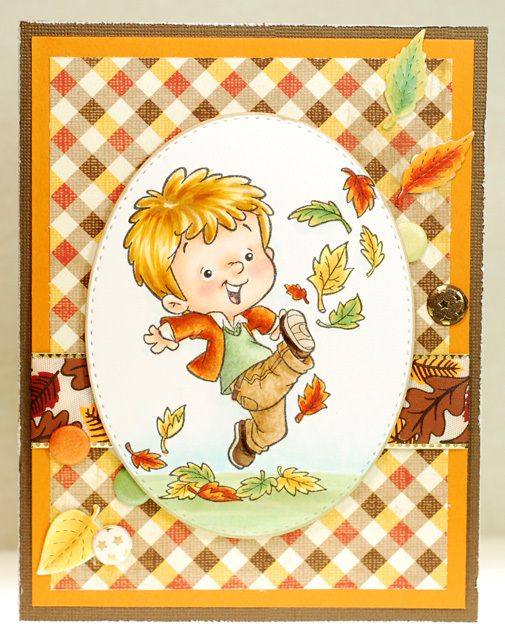 I gotta tell you, I had so much fun with this one... not only did I do the layering on the tree tops but I also cut myself a slightly wavy mask and repeated the stamping down below to create the illusion of the fallen leaves on the ground. It is doing stuff like that when I feel the most creative, LOL! Mmmm... the weekend. I can't wait to enjoy a couple days relaxing and enjoying this cooler weather we've been having. Sure I will spend some of that time walking the dog and getting a bit of exercise in the great outdoors but nothing beats donning some warm socks and yoga pants and spending quality time in the crafty room. Once again I have hit a point where my desk needs a good cleaning and I really want to gather a bunch of fall/Halloween papers and embellishments together so I have them all in one place. That should make the creative process easier for the next couple months. Ok, I'm outta here. Take care and have a wonderful weekend! 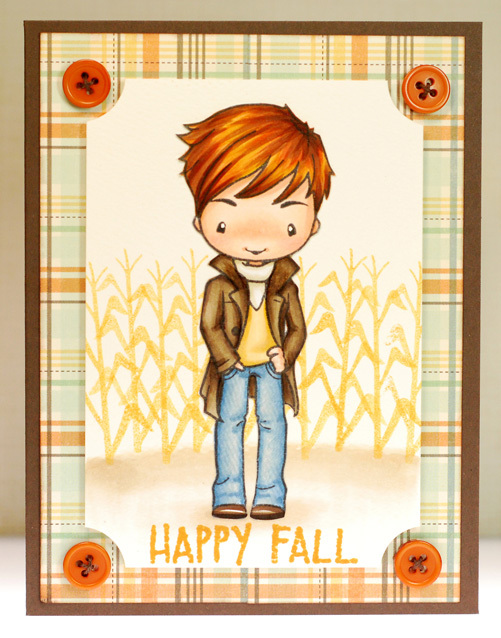 Yep, I've got another Greeting Farm card to share today but I couldn't help it because I am just so excited that Wild Sprout Amber is officially out there now. 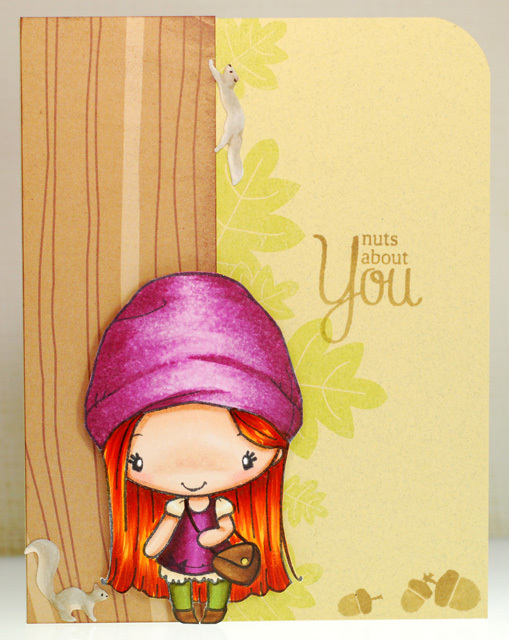 If you've been a follower of my blog for any length of time you probably know that I am quite fond of the Wild Sprout line of stamps at TGF. 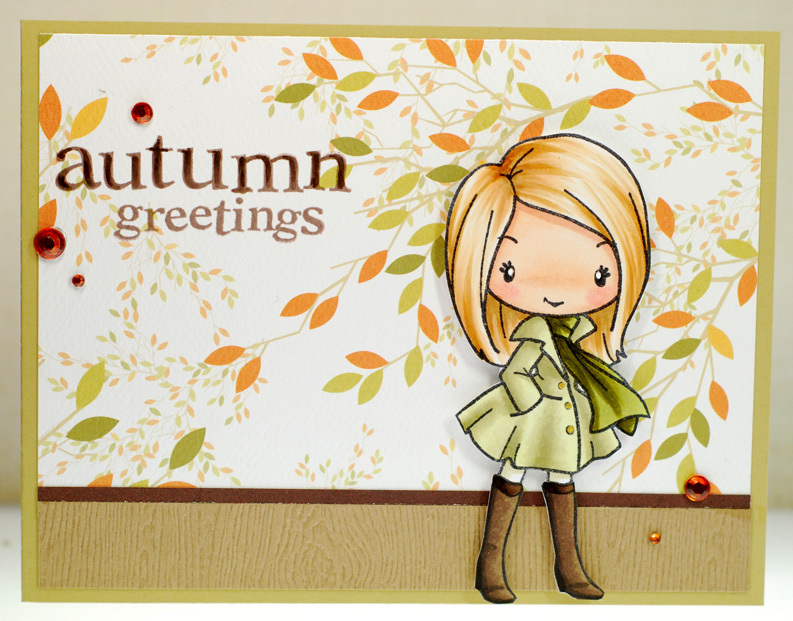 About eight years ago I had the honor of styling four Sprouts; Chelsea, Ruby, Gigi and Stella. Since then there has been Gracie and Addy and now Amber has joined the TGF family as well... I'm totally doing a little happy dance here. How do you get your hands on Amber you ask? 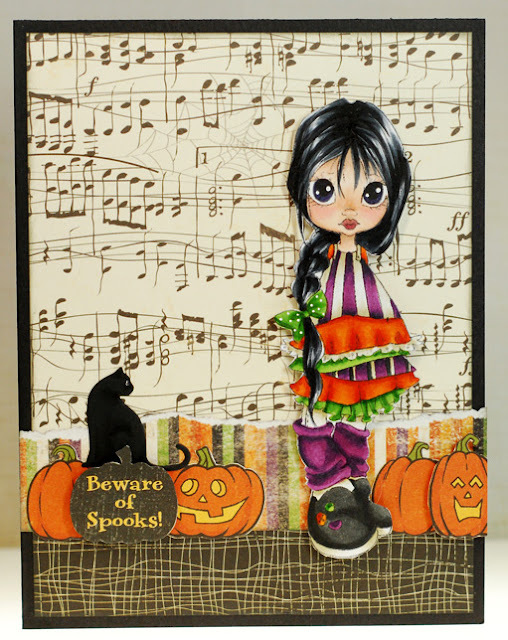 Well she is a free digi that you automatically get when you sign up for the Oct-Dec Super Secret Stamp Club by Sept. 5th. How awesome is that?! Alrighty, I'm outta here. Have a good one my friends!